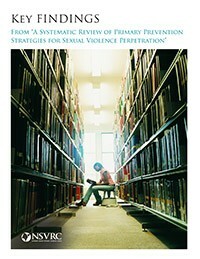 The National Sexual Violence Research Center (NSVRC) has released a user-friendly practitioner’s guide to a 2014 research article by Sarah DeGue et al. The original research article was a systematic review of the effectiveness of sexual violence primary prevention programs and strategies. According to DeGue et al.’s study, the only programs/strategies that have been demonstrated to be effective are Safe Dates, Shifting Boundaries, and the Violence Against Women Act of 1994. The article also identified some strategies that might be effective, even though evaluations haven’t been consistent enough to declare them definitely effective. Finally, the study found some programs to have no effect or even be potentially harmful. Here’s a link to the NSVRC’s report, Key Findings from A Systematic Review of Primary Prevention Strategies for Sexual Violence Perpetration. The research article that the NSVRC’s report is based on is can be found in full at no cost here.